Alan R. Fleischman, M.D., is clinical professor of pediatrics and clinical professor of epidemiology and population health at the Albert Einstein College of Medicine in New York. He recently ended a four-year tenure as senior vice president and medical director of the March of Dimes Foundation. In the academic area, he has published and lectured extensively in many areas of perinatal medicine and has been a pioneer in the field of bioethics, emphasizing the rights of individual patients and the responsibilities of health care professionals and organizations. This work has resulted in over one hundred fifty publications in peer reviewed journals and book chapters, including a book edited with Robert Cassidy, entitled Pediatric Ethics–From Principles to Practice, published by Harwood Press. He is a member of the board of directors of The Hastings Center. Robert Klitzman, M.D., is professor of clinical psychiatry, director of the Ethics, Policy and Human Rights Core, HIV Center, and director of the Master’s of Bioethics Program at Columbia University Medical Center. 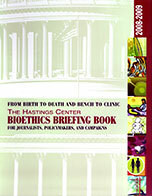 A member of the Division of Psychiatry, Law and Ethics, he co-founded and for five years co-directed the Center for Bioethics. He has written seven books and numerous articles drawing on multi-disciplinary methods to examine ethical, psychological and social issues in a variety of contexts in medicine and psychiatry. Specifically, he has examined decision-making concerning HIV disclosure, genetic testing and reproductive choices among individuals at risk for genetic disorders, Institutional Review Boards, and other topics. Claudia Kalb is a freelance journalist and former senior writer at Newsweek magazine. She has reported on a wide range of medical and scientific issues, including stem cells, autism, reproductive medicine, HIV/AIDS and childhood obesity. Her stories have been featured on the cover of Newsweek several times, and one of them was a National Magazine Award finalist in 2007. Prior to becoming a senior writer, Kalb worked as a general editor and correspondent for the magazine. She is the recipient of several journalism fellowships, including the John S. Knight Fellowship at Stanford University. Emily Laber-Warren is a longtime science journalist. She has been a top editor at Scientific American Mind, Women’s Health, and Popular Science, and her articles have appeared in those and other publications, including Psychology Today and Earth 3.0.